Retired town planner Sit Kwok-keung’s proposal to phase out the trams through Central Hong Kong is being rejected by Hong Kongers. Thousands have signed petitions and joined a Facebook group in support of keeping the 110 year old trams. The government backed away from the proposal saying it did not commission or pay for it. 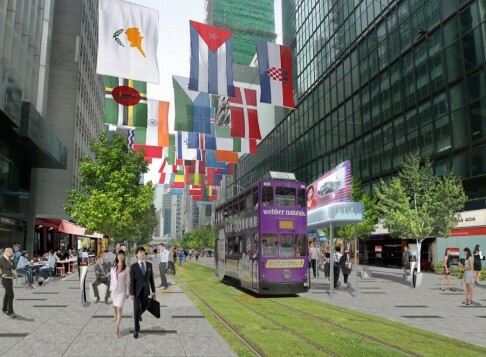 What has come out of this discussion is an interesting idea to ban all cars in Central creating a pedestrian and tram zone between the Western Market and Charter Road on Des Voeux Road Central. The government should study and support this proposal. Hong Kong has a pollution problem with the Air Quality Health Index reaching dangerous levels of 10 today in Central. Cars and buses are a major reason for air pollution according to the Environmental Bureau. By eliminating cars along Des Voeux Road Central the city can plant flowers, grow trees and create more green spaces to help clean the air. The re-greening of the area would make Central a more welcoming and enjoyable place to work and explore. The main argument against this proposal is a concern for traffic congestion on other roads. It is a valid point. With new MTR lines connecting Central with other parts of the city will help alleviate the need for busses and cars. There is also a new Central to Wan Chai bypass to be opened in 2017 to help alleviate the number of automobiles as well. Kwong Sum-yin, head of the Clean Air Network, told the SCMP, Connaught Road Central and Queen’s Road Central had spare capacity. The Institute of Planners’ proposal allows for needed delivery vans, bank security, and emergency vehicles but cars wouldn’t be allowed. It would have the same rules as the part time pedestrian zones in Mong Kong along Sai Yeung Choi Street South Street, in Causeway Bay, Lan Kwai Fong and even along Des Voeux on Sundays. The Town Planning Board will still meet on October 23rd to discuss the plan to phase out the trams and the plan to ban cars on Des Voeux Road Central. Hopefully the decision to ban the cars and keep the trams.